The purpose of the Elmo Memorial Trophy is to give due recognition to, and encouragement of the Newfoundland in the art of water work, that is one who performs well in working tests. Points will be counted annually between one AGM of the Northern Newfoundland Club to the next. A minimum of 3 points must be gained from water working tests. 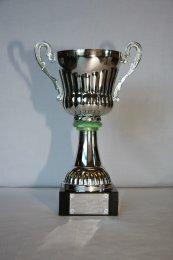 Where a dog has been entered in more than one Section in one day, only the points from the highest test passed that day will qualify for the trophy. eg: where a dog has entered B, C, D & E in one test weekend, passes B & E on one day and C & D on the other day only the points for E from the first day and D from the second day will count towards the trophy. The winner of the trophy will be announced and presented at the Northern Newfoundland Club Christmas Dinner, should you be unable to attend the dinner a nominee can be appointed to accept the trophy. The rules and regulations for awarding the Elmo Trophy are determined by the Northern Newfoundland Club Working Sub-Committee and may be amended at any time. Any such amendment will be published in the Northern Newfoundland Club news letter, NewfLetter and Website.